Animals are my life. They see the world in a way that we humans, unfortunately, cannot. They don’t take more than they need, and we have so much to learn from them. I’m so entertained by living things; the way they function, their personalities and even their manner of dealing with stress. To live alongside any creature broadens your view in so many aspects. By working at IHA, I can help give more animals a chance at a safer and longer life by being part of a medical team providing spay and neuter surgeries. In my future, I hope to become a Doctor of Veterinary Medicine, to be able to perform the actual surgeries and further help animals and their owners by providing an affordable veterinary option for their medical needs. My favorite part of the job is the well-rounded, proactive team I work with because that is the foundation of a successful clinic. I’ve lived my life at an efficient pace, practicing delegation and time management, so I’m lucky to work in a place where I absolutely must use both. In my picture is one of the most fun and expressive cats I’ve owned, Winston. He will respond to his name, run back and forth across our home at full speed and BEG for any sort of food. He’s been a delight through our stressful years in college and we’re so thankful to be a part of his life. Animals can’t talk, so you have to communicate with them in other ways, such as body language and food. We are an entirely different species and yet we as humans can still develop a bond with them. I really wanted to understand that bond and how animals use body language to communicate. I especially love learning the different personalities of each creature, figuring out what makes them click and what turns them off. It is especially rewarding when a creature decides to trust you fully. It is the greatest feeling on Earth. I am pictured with Rey. Her mom picked our porch to have her babies, and each of them was named after a Star Wars character. Rey and her siblings were spayed and neutered at IHA as soon as they were old enough. She loves other cats and is very sweet to any feral cat that stops by for supper. Last year, she had a friend we called Romeo because he would wait near the bottom of the porch for her and made sure she got back safely after a night of mousing. Rey’s favorite toys are dried up corn stalks. She loves to supervise my gardening or walking, but mostly she likes to lay on the plants or lay on my feet, so she isn’t very good at her job. My affinity for animals all started with Fritz the canary, Maggie the dog, and Arthur the cat, among many other little friends running through our house. I felt drawn to working with animals because they always express their truest self whether it be completely overjoyed, scared, or looking for some simple cuddles, and that warms my little beating heart. It felt like only a matter of when and where I would find the right opportunity to be a part of an animal-loving organization. 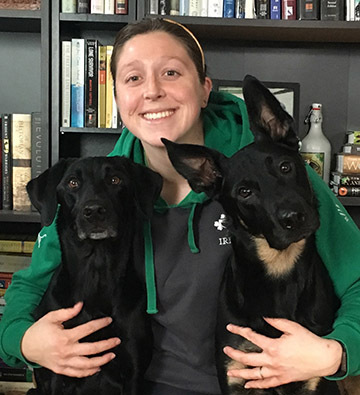 As most delightful, unexpected things happen in life, working at IHA fell into my lap, and now I get the best of both worlds – a way for me to be involved in the betterment of animals’ lives and connect with my hard-working team members every day. What a blessing! One aspect of IHA that strikes a chord in me is how focused and driven everyone is to ensure high-quality spay and neuter surgeries for all of our furry friends brought through the doors. Here, I am pictured with some neighborhood pals, Ty and a couple of goats. I have always had a love for animals, and I got that trait from my dad. I grew up on a beef farm, where I would help him with chores over the years. It was always a family affair, and we would all help with sorting cattle or feeding all the bottle calves (which was my favorite). He is a great caretaker of the land and his cattle, but what really resonated with me was his passion for his herd. He would spend countless hours with them making sure they were healthy, and would go to great lengths for their care if needed. My dad instilled many traits in me; including his work ethic, passion, dedication, and respect for his animals. He is one of the many reasons as to why I work with animals. Growing up in the country I was surrounded by cattle and horses, and we had a dog and some barn cats. I always loved caring for them and learning as much as I could. I came to work at a pet store and had to answer or help assist in solving so many different situations that pet parents would find themselves in. We had two vet technicians and several associates that had been working with animals of all kinds for so long that they seemed to have an answer for everything. I loved listening to them and learning the tricks and hints they had found. I was also required to help in the grooming salon attached to the store, and it was there that I learned about calming stressed animals and being able to react without affecting the animals while keeping everyone safe. They started requesting my help more frequently because of my calm and positive demeanor. There was also units for adoptable cats and I would interact with the different volunteers from various shelters and would hear about how overrun they were and how so many still needed help. I knew from a young age that I wanted to work with animals in some capacity but wasn’t sure how. 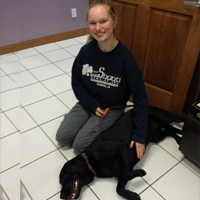 My goal now is to become a veterinarian (I am applying to vet school this summer), so Iowa Humane Alliance provides great experience. IHA provides a much needed service to the community through reducing the number of breeding animals in Eastern Iowa. While I truly love every part of my job, I especially love seeing an entire litter coming in together when they are reunited from various foster/adoptive homes for their spay and neuter appointments. I am pictured with Molly (chocolate lab) and Sparki (terrier mix). 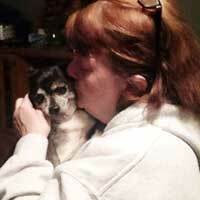 Sparki showed up on our doorstep nearly 10 years ago and never left! I showed her for several years in 4-H Dog Shows, while she tolerated obedience classes, she loved agility! Molly is missing a hind leg due to cancer, but gets around just fine and has been cancer free for a year and a half! Growing up I always had an affinity for animals. I LOVED doing chores and getting messy, much better than housework, which my older sister was stuck doing. I was attached to the cats and dogs, and their babies. I can’t explain why I am drawn to animals. I can go all week working with them, but end up seeing a dog at someone’s house and insisting on saying hi or petting him. Animals are honest. I appreciate that. I love pretty much any animal. My favorite part of my job is knowing the more wild, or barn cats, will be healthier at this same time next year. When I had the mobile unit I loved seeing the crazy, scrawny cats of the year before, now much mellower and thriving. There are many things which prepared me for my role at IHA. I already did regular private practice Veterinary medicine for 8 years outside Seattle, WA. I also have done years of work at shelters where euthanasia of healthy animals happened almost daily during the heavy puppy and kitten season. I was part of it at one shelter, euthanizing a mom cat, then her kittens, broke my heart. That is when I decided I would do what I could to make euthanasia of healthy animals unnecessary. Learn more about Dr. Doll here. There are so many reasons why I LOVE working at IHA! Our work here is making a positive impact for animal welfare in the community and it is extremely rewarding to be able to actually have solutions to offer animals and their people. Every day I work for the thing that I am most passionate about! My days are rich and full. 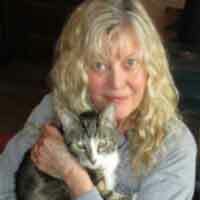 I like all aspects of my job with IHA, from entering animals, to invoicing the animals, to the phone appointments. I enjoy working with people to help them get their pets spayed, neutered and vaccinated and to see the smile on their face knowing that their pet will be healthy. I love working with animals and with clients to give them an understanding of vaccinations and the importance of spaying and neutering their animals to keep them healthy. I love all animals, feathered, scaled, and furry, and was taught to respect all life at a very young age. Growing up, my family pets were my companions and my best friends. I knew early on that I wanted to spend my life helping the creatures I loved. Like many other children, I was going to grow up to be a veterinarian. That direction changed gradually through my education and experience, which lead me to Iowa Humane Alliance (IHA). 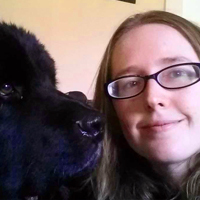 I am pictured with Molly, my 9 ½ year old Newfoundland. I adopted Molly from Cedar Valley Humane Society. I had never adopted a senior dog before, but I fell in love with her the moment I saw her. I knew we needed each other and so nearly a week later, I brought her home. She was instantly part of our family. She has been simply a joy, and has even helped our cats become less afraid of large dogs! I am so grateful that we found each other. My favorite part about my job is knowing that we are able improve the quality of so many animal’s lives through spaying and neutering. It is an amazing feeling to be a part of a hardworking team that is able to make such a big impact for animals in our community as well as the communities that we are able to reach out to. 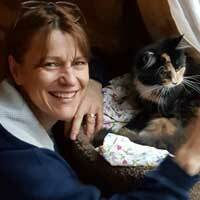 During my career in animal welfare, I had worked at two municipal shelters and saw the full spectrum of animal care. I held the role of veterinarian technician, volunteer coordinator, humane investigations officer, adoption counselor, natural disaster rescuer, and cared for thousands of cats and dogs. 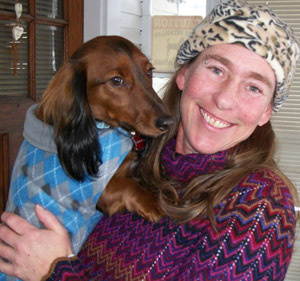 I was working in Upstate New York when Mary phoned and asked me to come work at Iowa Humane Alliance. Mary said that the clinic was scheduled to open in 8 weeks and that 5,000 surgeries would be performed in the first year. I thought, WOW, how amazing. I did a little research on high quality, high volume, low cost spay/neuter clinics and everything suddenly became so clear. Somewhere around 12,000 surgeries performed, I became the Director of Clinic Operations. Currently, I am the Executive Director of IHA, overseeing all—and we’re just over 31,000 operations. My passion for animals started at a very young age. I’ve always grown up around dogs and felt a strong connection to them. I knew wherever my career took me it would involve animals in some way or another. When I came across the opportunity to work for Iowa Humane Alliance, I didn’t think twice. I knew this would be an amazing opportunity. I believe so strongly in the IHA mission statement and to share a common dedication with everyone who works here is so rewarding. I love that every day is different. Our clients are amazing and to meet so many wonderful pet parents who are very appreciative of what we do is one of my favorite parts of the job. I knew a career with IHA would be a perfect fit for me. 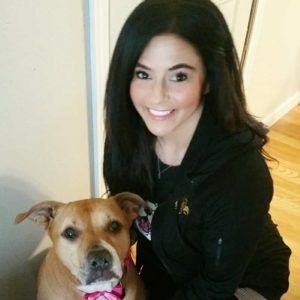 I have a background in office management and event planning along with multiple years of dog care and volunteer work with our local animal rescue organizations. I’ve worked with all types of animals and currently have 2 cats (Meows and Steve), and 8 year old pit bull (Bella, pictured with me) and 2 ball pythons (Marvin and Lilly). We simply could not do what we do without the generous participation of our volunteers.